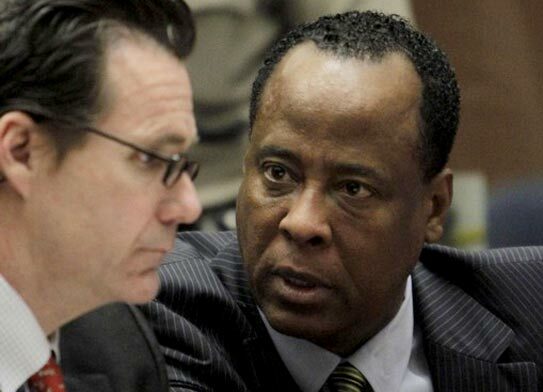 LOS ANGELES: Attorneys for Michael Jackson's former physician Conrad Murray, on trial for involuntary manslaughter in the death of the pop icon, want a sequestered jury during Conrad's trial, court papers showed Friday. “There is reasonable expectation that Dr. Murray's trial will be the most publicized in history,” wrote the doctor's attorneys in court papers given to Judge Michael Pastor. “It is necessary to sequester the jury in order to ensure that it is free from outside influences and guarantee the defendant a fair trial by an impartial jury,” said attorneys Edward Chernoff and Nareg Gourjian. Judge Pastor will review the request, and a hearing is set for August 25. In July, the judge said he did not support sequestering the jury, and he estimated that the measure was unnecessary and said the system cannot afford the costs associated with isolating the jury for six weeks. They added that isolation is the sole way to ensure the jury's decision-making process is not tainted. “Although there is a cost with ordering sequestration, it is comparatively minimal compared to the costs that would be incurred by a retrial or new trial that would be required as a result of contamination,” the attorneys wrote. Jury selection is scheduled to begin September 8, and opening statements will take place on September 26. The trial was originally scheduled to begin May 9, but was pushed back at the defense's request after they asked for time to develop cross-examinations for new witnesses from the prosecution. Murray, the last doctor to treat Jackson, is on trial for involuntary homicide in the “King of Pop's” death on June 25, 2009 at the age of 50 after an overdose of the anesthesia propofol, which the singer used as a sleeping aid. Prosecutors say Jackson died from an overdose of the powerful sedative propofol, which Murray was in charge of administering to help alleviate the star's insomnia. Murray's defense is expected to argue that Jackson gave himself an excessive dose of the drug while the doctor was out of the room at the singer's mansion in the affluent Holmby Hills neighborhood west of Los Angeles. If found guilty, Murray could face up to four years in prison.